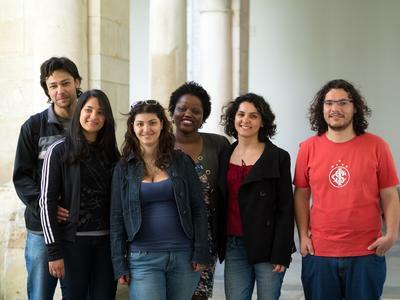 Coimbra offers students high-quality life at reasonable costs, when compared with other European cities. other expenses : sports, culture, clothing and leisure. The items taken into account include: gym monthly instalment, tennis (1 hour per week), cinema/ show ticket, clothing and one meal at a restaurant. There are other accommodation options at the UC residences: single room and double room for single use. Check the different options, conditions and prices here. Outside the UC residences, there are several lodging offers for students, for instance the possibility of renting apartments with or without furniture and equipped kitchen, bedrooms in family houses and private residences. Learn more at uc.pt/accommodation and uniplaces.com/accommodation/coimbra. UC has 14 university canteens, bars, snacks and buffets, with take away service, which offer a wide variety of food: Portuguese and Mediterranean food, pizzas and pastas, vegetarian dishes and sandwiches. In the snacks and buffets, the prices are around 4 to 11 euros depending on the choice of the dishes. Given the size of the city, almost everything is located at a walking distance, for instance from the University to the canteens and to the residences, but also to several other city spots. In this way, you can save some money in transports. However, it can be very useful to have a monthly pass that allows you to travel rapidly within the whole city and its surroundings at economical prices. Coimbra is a friendly city to the young people. With over 30,000 students, it offers several discounts for students in restaurants, bars, shops, hairdresser, beauty shops, public transports, gym, swimming pools, bookshops, theatres, cinema, art galleries and museums, among others. The University of Coimbra has its own medical services that provide general practice examinations and speciality examinations that cost around 5 to 10 euros according to the required type of examination.